Once you click on the “Delete This Transaction” link, the transaction will be permanently deleted. You will not be able to reverse this action. After the deletion, you’ll be brought back to the security’s page. After you confirm the delete, you’ll be brought back to the main page. As the warning suggests, the deletion is permanent, and all transactions associated with the security will also be deleted. If you have multiple portfolios then the transactions in all your portfolios associated with the security will be deleted. This entry was posted in AdjustedCostBase.ca Site Help on June 24, 2014 by AdjustedCostBase.ca. 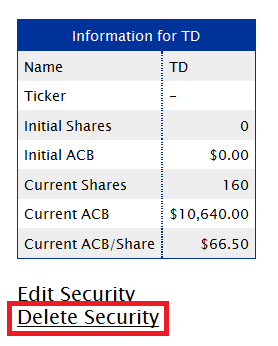 Not thinking…I began deleting some of the securities in my TFSA account that were not actually associated with it. After a moment I realized ALL of the other accounts were being affected. Guess I know what the answer is. Is there any way to reverse this. A time reset. No backup for me. I need to reconstruct. Otherwise, a really very useful site. I tell everyone about it. If you use the “Contact Us” link above to send a message about this we can look into the possibility of a solution.